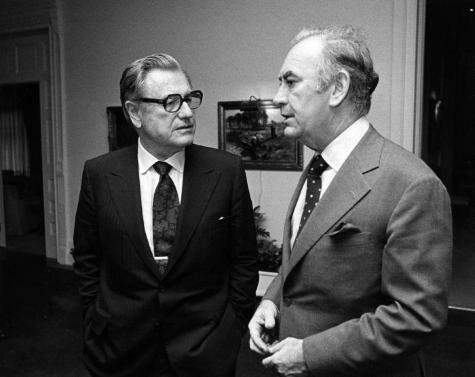 Former Governor Nelson Rockefeller (left) chats with Governor Hugh L. Carey at the Executive Mansion reception for the Regents. ;Earlier in the day, honorary degrees were bestowed upon former governors Rockefeller, Wilson, and Harriman. Source: New York State Archives. New York (State). Governor. Public information photographs, 1910-1992. Series 13703-82, Box 4, No. 10688_033.